Welcome to a very special place. The Duchess of Somerset's Hospital is not a hospital at all, but a sheltered housing scheme for women, operated by an historic trust. It is based in Froxfield, Marlborough, Wiltshire close to where the Duchess once lived. 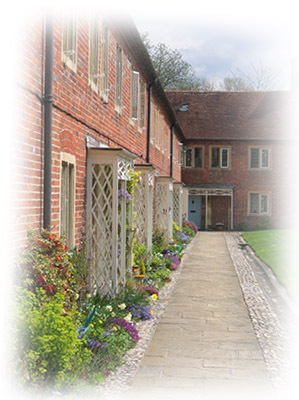 The accommodation was first founded around 1695, under the Will of Sarah, Duchess of Somerset, an important social benefactress, who wanted to build a set of houses and a chapel for widows from Wiltshire, Somerset and Berkshire. Over the course of time, this group of houses came to be called 'the collegiate' and is now referred to by residents as 'The College'. Today, these 50 historic self-contained units, known as cottages, are fully modernised and maintained to a good standard. They are arranged in four terraces in the form of a quadrangle, with views into the serene and secure grounds, with the ancient chapel at the centre of the green. The residents, all female and over 55, are from a rich and diverse mixture of backgrounds. Interested in knowing more? After browsing this site if you wish to have more information, we invite you to contact the Steward who will answer any questions you may have and help you arrange a visit to get a better understanding of the accommodation and surroundings. To view some of the special views around the College and read some quotes from residents please click on our Photo Gallery and About Us pages.